How are you all? Those who are in US might be getting ready for super bowl Sunday. What are you planning to cook for watching the exciting game? For us, it will be mostly Indian. After reading my Facebook status last week,about the chance of an early Spring, mother nature decided that Colorado needs more snow. Today we are having a big big snow day.While I sit here,there is an accumulation of 18 inches of snow and it is still snowing. 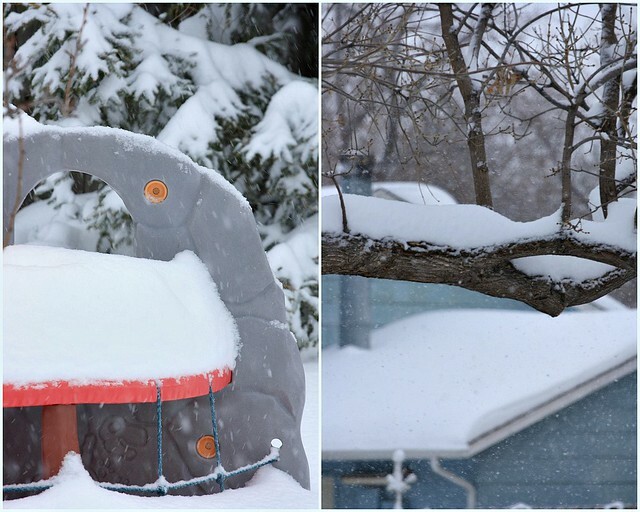 This might be one of those days which will be in the history forever, if the predictions are right.We will have more than 2 feet of snow by tomorrow, which is not usual for a day of February in Colorado. Though it has been snowing throughout the day, the family had quite a busy day shoveling, sledding, cooking and eating.Probably that delayed me from posting this in morning.Despite that today was fun and we got a three day weekend ! This is a very simple stir fry,you can whip up in a jiffy when you are in a hurry. 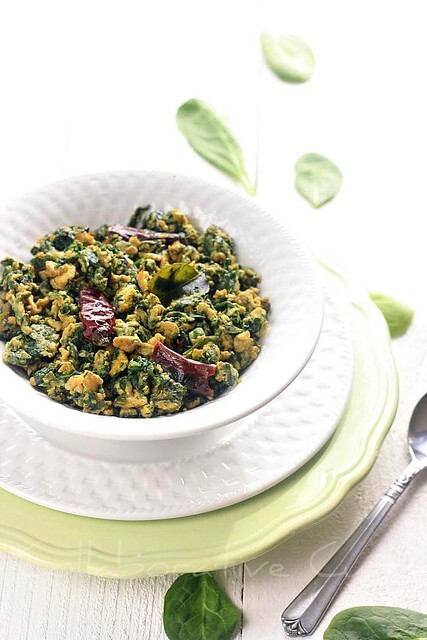 Just give a tadka, throw in the spinach,wilt it and add the eggs and scramble- that's all !I can tell you even if it's simple to make-it's absolutley delicious,and my daughter who doesn't like spinach loved this fry. 1.Chop the spinach, if the leaves are big.Otherwise it is ok to leave it as it is. 2.Heat oil in a frying pan.When it is hot, add the mustard seeds and let it splutter. 4.Throw in the shallots and let it brown a bit, followed by red chilies and curry leaves.Add the split green chilies and saute for a minute. 5.Add the chopped spinach along with turmetic powder and let it wilt and let some water gets absorbed.Keep the heat on medium and stir it in between. 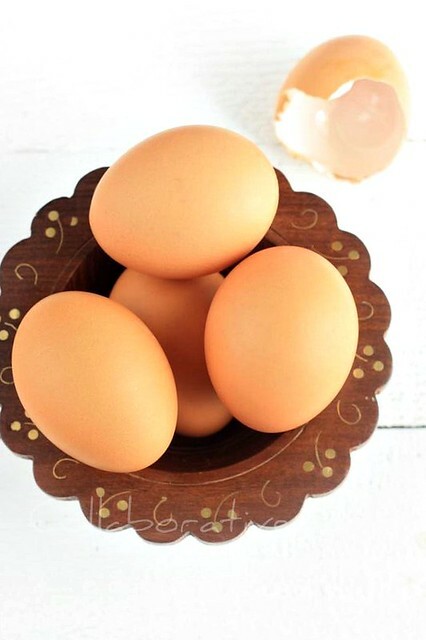 6.Make a well in the middle and add the eggs and black pepper.Make the scrambled egg by letting the eggs get cooked for a minute and scrambling later.When the eggs start getting cooked, mix it with the spinach. 7.Stir till the mixture is dried a bit. Switch off the heat and serve warm with rice or roti. looks awesome got to try this one ....love eggs and love spinach !! Very beautiful ..yummy dish as well. Delicious and yummy looking thoran. I make the same stir fry especially when I've less spinach to be served standalone. Great clicks as usual n for us not much snow this time. yummy stir fry and your kids eat spinach too... now thats worth trying! You know what.. One of my aunt's used to make this.. I loved it then but totally forgot about this recipe.. thanks a ton for posting this :)? This sounds very good. I will be excited to try it! Happy to be in Virginia - as yet not slammed by winter!!! This is an interesting mix, one I have not tried, partly because we are not big egg eaters - but I think the scramble looks delicious! Wonderful dish and gorgeous photos!! Superb clicks of yummy dish..
Wah so much snow! This year SF hasn't been having much rain (tonight it will be!) that mountains have no snow. I can't believe how dry it is. 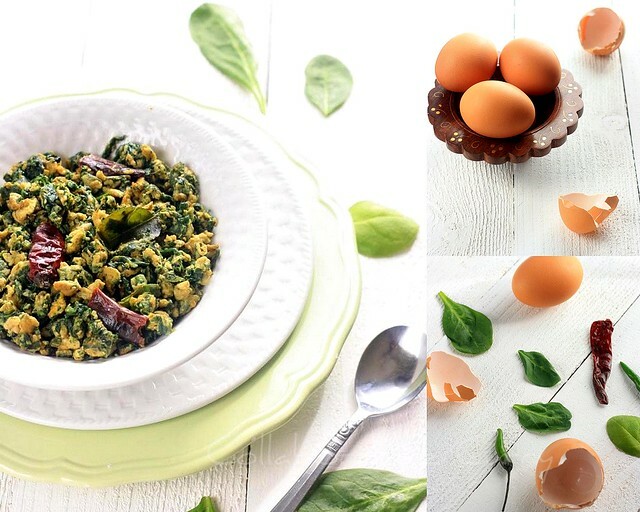 Your spinach and egg stir fry looks delish. Wish my kids can eat something like this. Beautiful photos Namitha! I make anda bhurji so much and never ever did I think of using spinach. I definitely should make this tonight! I think this one is suited to me because I really love eating spinach especially when it have lots of eggs. I must give this a try tomorrow so that I can eat a lot for my breakfast. Thanks for sharing your great idea!